"Anacreon: Reconstruction 4021 is a DOS computer game originally written by George Moromisato, and published by TMA in 1987. The game's theme was galactic conquest, with the setting strongly inspired by Isaac Asimov's Foundation series of novels. It was one of the first computer strategy games, and is an example of a 4X game (eXplore, eXpand, eXploit, eXterminate). 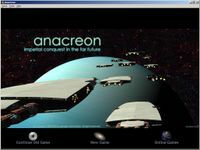 A Windows remake, titled Anacreon: Imperial Conquest in the Far Future, was released by George Moromisato in 2004." Source: Wikipedia, "Anacreon: Imperial Conquest in the Far Future", available under the CC-BY-SA License.